In celebration of International Women’s Day on March 8, we’re featuring a 24-hour marathon of women composers on Second Inversion. Tune in all day long to hear works by over 200 women who have helped shape, inspire, and expand the world of classical music. For much of classical music history, socially-prescribed gender roles excluded women from participating in composition. Women were denied access to musical resources, financial patronage, art and music networks, and performance and publication opportunities. It had far reaching effects: what we now consider the Western classical music canon solidified around the music of white men, and even in the 21st century concert programs are still overwhelmingly dominated by the music of male composers. According to a survey of 89 American symphony orchestras, women composers accounted for only 1.7 percent of the total pieces performed in the 2015-2016 concert season. Research conducted by the Baltimore Symphony Orchestra. Infographic by Rachel Upton and Ricky O’Bannon. Second Inversion is working to help balance the scales. We’re proud to feature music by women composers today and every day on our 24/7 online stream and web publication. Click here to stream our 24-Hour Marathon of Women Composers from anywhere in the world, and check out our hosts’ top music picks below. For more resources (including 50+ pieces of advice from women composers), visit our Women in (New) Music series. Azerbaijani composer Franghiz Ali-Zadeh performs this solo piano piece, but with some prepared piano sorcery she manages to create the illusion of a duet. Just before sitting down to record, she draped her necklace over the middle range of the piano strings, making it sound like a string instrument called a tar (similar to a lute) that her father played. Music for Piano is a bold fusion of the traditional music of her homeland and adventurous experimental music of the present. The way she draws from her culture adds a philosophical and mysterious tinge to this lovely piano composition. “Listen to everything all the time and remind yourself when you are not listening,” Pauline Oliveros said in her 1998 keynote address at the ArtSci98 symposium. Over 20 years later, those words have come to encapsulate the astonishing legacy left behind by this pioneer of experimental and electronic art music. I lived in Houston for most of my life, and one of my favorite places there was the Rothko Chapel. The peace of the Chapel is thick and indifferent—an atmosphere created in large part by the giant Rothko paintings on all of the walls. For lots of reasons, it’s a place a I love and return to. When Madeleine Cocolas moved to New York City, the Metropolitan Museum of Art was that kind of place for her—a place she loved and found herself returning to. Her album Metropolitan is a tribute to the museum. She took her nine favorite pieces from the Met and used software to analyze those visual works and turn them into sound. She then incorporated the sounds generated by the software into her compositions. For Rothko, No. 16, she represents the four major colors in Rothko’s piece with four chords, and the pitch of each note in her piece is determined by the intensity of the color. Second Inversion’s 24-Hour Marathon of Women Composers is streaming worldwide all day on Friday, March 8. Click here to listen. Join us Friday, March 15 at 5pm at T.S. McHugh’s for a happy hour co-hosted by Second Inversion and the Live Music Project. Bring a friend, make a friend, have a drink, and discover connections with fellow new music lovers from all over Seattle! Concerts of contemporary composition, free improvisation, and sonic experiments. This month: analog synths, amorphous sounds, and Indonesian gamelan. Mason Bates takes you inside the life and legacy of one of the greatest minds of the digital age in this opera about the intersections of technology, spirituality, and ambition. John Cage’s original percussion ensemble, founded at Cornish in 1938, is relaunched by co-directors Kerry O’Brien and Greg Campbell. Learn more in our Q&A with the directors. Be among the first to see Seattle Symphony’s brand new immersive performance space dedicated to experimental music and education. Plus, check out a wide variety of concerts at the venue throughout the month. Octave 9 at Benaroya Hall. Photo by James Holt. Schoenberg’s masterpiece of melodrama tells the tale of a moonstruck clown and his descent into madness. Bass baritone Nicholas Isherwood performs with the ensemble. Experimental flutist and composer Robert Aitken performs original works with the Seattle Modern Orchestra, plus music from Toru Takemitsu, Iannis Xenakis, and Brian Cherney. Asian and Asian-American voices are celebrated in this concert of choral works from composers representing China, India, Indonesia, Japan, Korea, Mongolia, the Philippines, Thailand, and the U.S.
Composer-in-Residence and clarinetist Derek Bermel curates an evening of jazz-inspired performances featuring cellist Seth Parker Woods, pianist Ethan Iverson, and Seattle Symphony musicians. Hovering above his usual collection of keyboards and synths, German composer Nils Frahm draws out an ambient mix of minimalist melodies and dance grooves. Seattle-based trumpeter and bandleader Samantha Boshnack takes listeners on a sonic adventure into the Ring of Fire in Seismic Belt, her large-scale work for seven-piece band. Samantha Boshnack. Photo by Daniel Sheehan. Artistic Director Peter Boal’s annual selection promises modern and experimental music paired with bold, beautiful choreography. PNB dancers perform to music by Sufjan Stevens, Oliver Davis, and Kyle Vegter. Cellist Sæunn Thorsteinsdóttir and pianist Angelo Rondello collaborate on a program highlighting the immense musical flourishing of Icelandic composers working in the decade following the economic crash of 2008. Based on the dark sideshows of Coney Island, the Talea Ensemble’s theatrical chamber piece Sideshow styles the performers themselves as characters, exploring the line between entertainment and spectacle, virtuosity and freak show. A hodgepodge of scrap materials, cheap toys, and everyday objects form the instrumentation for Robert Honstein’s An Index of Possibility. See the piece performed live by Storm Benjamin, Rebekah Ko, and Garrett Arney amid a swirling light show. The chaotic colors of Pierre Boulez’s restlessly virtuosic Sur Incises are balanced against the haunting dreamland of Luciano Berio’s Circles, a dramatic setting of three poems by E. E. Cummings. Immerse yourself in a nonstop multi-disciplinary showcase with music from over 50 living composers across the span of 24 hours. Choose from one of three 8-hour blocks or stay for the full 24-hour marathon. Two cult universes collide: Inverted Space presents a reinterpretation of the music from Twin Peaks featuring a handful of Harry Partch’s handmade microtonal instruments. Fifty years ago, an upright piano flew from the sky and crashed loudly upon the ground near Duvall, Washington, smashing into pieces in front of an audience of avant-garde enthusiasts. It was dropped from a helicopter by the Jack Straw Foundation (then in the form of KRAB radio) as a fundraising event for the experimental radio station and their friends at Helix, the hippie newspaper. This month, that historic piano is being resurrected. Piano Drop is a historical music installation now on display at the Jack Straw New Media Gallery. The exhibit showcases the remains of the fallen piano for the first time since the helicopter drop, along with archival film footage, historical documents, and new recordings of music composed and performed on the instrument. And, you can even see the piano performed live. On Febraury 23, Jack Straw presents a special one-night-only live performance of new works composed for the instrument and performed by local musicians, including new works from Amy Denio, James Borchers, Jeffrey Bowen, and Luke Fitzpatrick, among many others. Though all of the music was written in response to a clamorous piano drop, the concert pays equal tribute to the aleatoric sounds of near-silence; in the spirit of John Cage, each of the featured works is 4’33” or shorter. Piano Drop is on display at the Jack Straw New Media Gallery through Friday, March 15. The live performance is Saturday, Feb. 23 at 7pm. Click here to learn more. 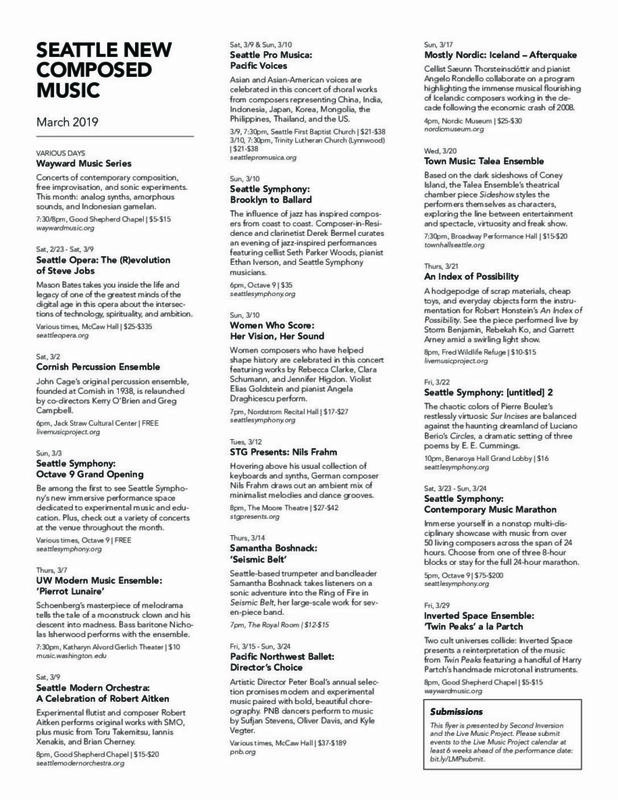 Concerts of contemporary composition, free improvisation, electroacoustic music, and sonic experiments. This month: white noise, dark ambient, abstracted songs, and Kurdish rhythms. Beethoven’s Third Piano Concerto was the inspiration behind Caroline Shaw’s Watermark, which receives its world premiere at Benaroya Hall. Pianist Jonathan Biss performs both pieces with the Seattle Symphony, conducted by Ludovic Morlot. Take a peek behind the scenes in our interview with the composer. The Seattle Metropolitan Chamber Orchestra explores connections between Indian classical music and flamenco in this program featuring music of Manuel de Falla, Ravi Shankar, Anoushka Shankar, and Jason Everett performed with guest soloists. Erin Jorgensen (left) and Rose Bellini (right). New music luminaries Erin Jorgensen and Rose Bellini assemble a cast of Seattle’s top new music movers and shakers for this wide-ranging program of chamber works by David Lang, Anna Clyne, Carla Kihlstedt, Marc Mellits, and Caroline Shaw. Did we mention it takes place amid a dreamy neon light show? The concert’s creators take us behind the scenes. Seattle avant-gardist Amy Denio and her band perform her original film score alongside this special viewing of the 1925 silent film Varieté: a tale of jealousy, obsession, and murder set against the backdrop of the circus. Syrian clarinetist Kinan Azmeh performs the world premiere of his clarinet concerto with the Seattle Symphony in this concert celebrating cross-cultural collaboration. He’s joined by the musicians of the Silkroad Ensemble for music by Vijay Iyer,Edward Perez, and Chen Yi. Fairy tales, folk songs, and the music of Schumann are a few of the major influences behind violist Melia Watras’s new album. She performs new works from Schumann Resonances alongside special guests. Hear our sneak preview of the album. No scores, no plans, no safety net: just a whole bunch of artists from all different musical backgrounds collaborating in an atmosphere of spontaneity, intuition, and discovery. Experience the handmade microtonal instruments of Harry Partch in this concert featuring new works composed for his instruments paired with rarely-performed works from the composer’s archives. Take a tour of the Harry Partch Instrumentarium. Visiting percussionists John Lane and Allen Otte perform music from their performance art piece The Innocents, which uses found sounds, street percussion, thumb pianos, and electronics to explore issues of wrongful imprisonment and exoneration. The concert also features the UW Percussion ensemble performing works for speaking percussionist. The composer-performer troupe Kin of the Moon presents the world premiere of Ewa Trębacz’s Winter After Times of Fire, a surround-sound collage of improvisations from a wide range of sonic spaces, including the Fort Worden Cistern. Also on the program are new works exploring graphic scores, forgotten sounds, and film. Openness of heart and mind is the overarching theme of this choral concert featuring wide-ranging works from Reena Esmail, Ted Hearne, David Lang, Jennifer Higdon, Evan Flory-Barnes, and more. The fractured remains of a piano dropped from a helicopter 50 years ago become the canvas for a concert of brand new works by local composers. Discover the story behind the instrument. David Lang’s Pulitzer Prize-winning the little match girl passion tells the haunting tale of a poor young girl who freezes from the bitter cold of the cruel world around her. The harrowing oratorio sets Hans Christian Andersen’s original story in the format of Bach’s St. Matthew Passion. Few artists inhabit both pop and classical worlds so freely and convincingly as Shara Nova, the operatically-trained singer and composer behind the art rock band My Brightest Diamond. She performs music from her new album A Million and One. Mason Bates takes you inside the life and legacy of one of the greatest minds of the digital age in this opera exploring the intersections of technology, spirituality, and ambition. Learn more about the music in our album review.